Now if you can guess what that is a clue for, you are quicker than I am:) Most of my previous posts have been centered mainly around food, but for this entry I thought I’d introduce another food for the senses which is music. For those of you that enjoy jazz, or are interested in hearing some fantastic live music, you should check out the SF Jazz Festival. Last Friday, I was a very lucky lady and was surprised and treated to a fantastic evening of live jazz from a modern Lady Day. It was none other than the highly acclaimed DeeDee Bridgewater, or “double d” + “bridge” + “eau (which means water in French)”! She was phenomenal, as was her band. I didn’t realize how talented or accomplished she was either – two-time Grammy award-winner as well as a Tony-award winning actress! Hearing her voice evoked thoughts of Billie Holiday as well as Ella Fitzgerald and I was so impressed by her range and dynamic presence on stage. 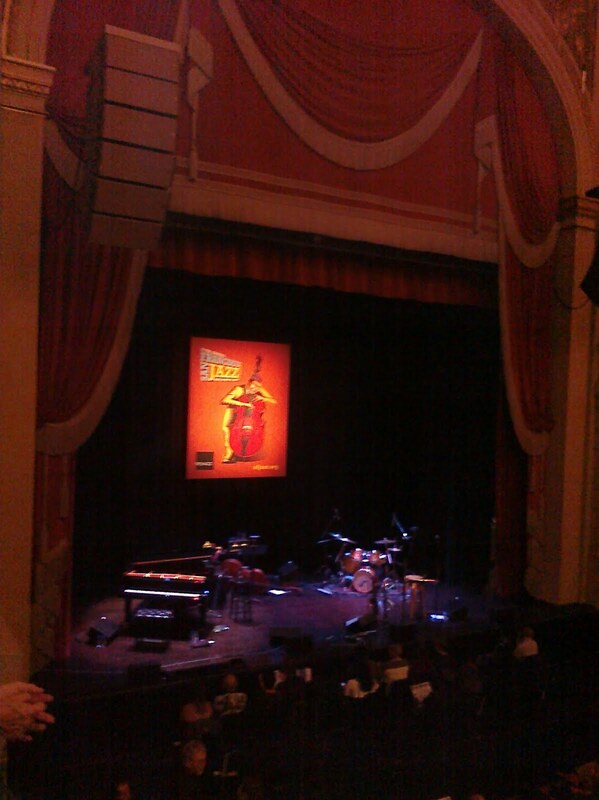 The performance was at Herbst Theater, which is a pretty intimate theater in the City, and it was certainly packed. Also, since it was a surprise evening, the only guidance I was given about the dress code was that I should dress up. I’m glad I did, because there’s just something really nice about dressing up and going to the theater with someone special. I’ve always loved going to the theater, broadway, and viewing live performances. There is just something very inspiring about watching talented artists perform a craft that they have perfected. No matter what kind of artist, whether it’s a musician, a painter, a dancer, or a professional athlete, being able to watch these people live is truly a treat for the senses. And if you want to hear more music from DeeDee and her contemporaries, you should listen to a channel I created on Pandora.